Barzilay is a PhD student of history at Yale and currently a visiting fellow at Vienna`s Institute for Human Sciences. He focuses on intellectual history, momentarily particularly on the Anglophone reception of Michel Foucault. Barzilay recently got a chance to have a peak in the newly found Foucault`s notes which made his current research possible. Even though the text below might send a message that Barzilay thinks of his idea as spotless, it is not the case. He is quite aware of his weaknesses but these need a whole new discussion. He basically goes back to the 1950s, proves Foucault was very influenced by Nietzsche already back then, and shows all his work in a new, correct light. 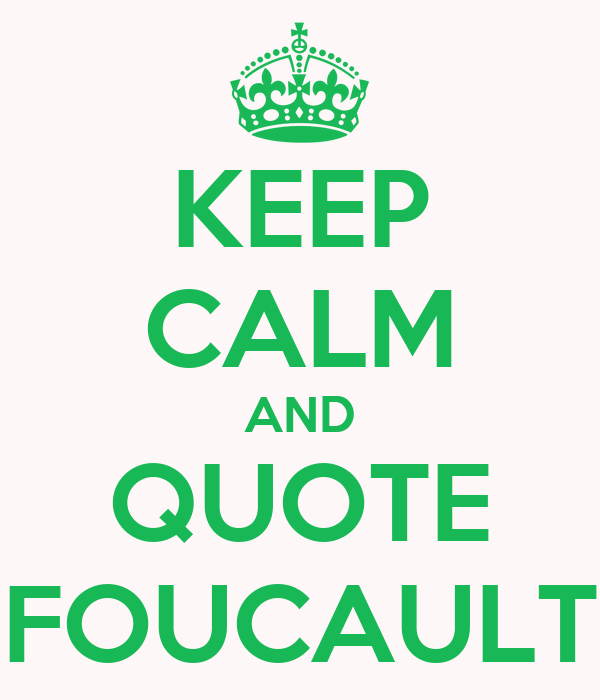 Above all, he suggests Foucault`s works from different periods should be seen in harmony, as a whole. Foucault is now more popular than ever, he is the most cited author in humanities and Barzilay suggests he might have even become a commodity. All this causes him to be one of the most misunderstood authors. It is however partially also the vagueness of his texts that causes it. At the moment possibly the most popular debate on Foucault is on his relation to neoliberalism – was he one or not? This is just one among many questions that could easily be resolved if Foucault would be seen as a whole and not only through his late lectures. In the case of neoliberalism question it is his 1978-79 lectures. People tend to understand Foucault only through his last period and it is the case in the Anglophone world as well. It is this scholarly tradition that has most authority when it comes to studying Foucault. To be able to speak of his reception in the Anglophone world Dreyfus and Rabinow must be mentioned. However Barzilay puts forth already in the introduction that it seems curious Dreyfus and Rabinow notice Nietzsche`s influenced only later in Foucault career, when it is clear already in The Order of Things, especially in its conclusion, how much Nietzsche influenced him from early on. Dreyfus and Rabinow met Foucault in 1975 when he visited Berkley for the first time, he continued to do so almost every following year and bonded with the two who were and remain inspired by him. There is a fundamental division of Foucault`s work. Archeology is how the first period is usually called (1960s), it transforms to genealogy, the period when the method changes and Foucault gets more concerned with politics and power (1970s), and then in the 1980s we talk of his turn to ethics and antiquity, but what about the 1950s? Barzilay is intrigued why no one talks of this decade. The aforementioned division is so strong that it divides people into different fields, depending on the period they study, however this seminar argues precisely against this. Foucault should be studied as a unity; only in such way can he be comprehended accurately. Dreyfus and Rabinow claim that discovering Nietzsche really influenced his thought which definitely is the case, however this did not happen in 1969 when Foucault wrote a text on him but already in the 1950s as Barzilay disputes in this seminar. In order to truly understand Foucault and avoid modern misinterpretations of him we therefore need to go back to 1950s. Foucault (with the cowboy hat) with Dreyfus and Rabinow on his first visit of Berkley in 1975. Foucault was a student of philosophy and strongly influenced by two currents of thought during his student years. The relevance of Marxism is due to postwar circumstances and a practical reason – Althusser`s influence on his students. Many, including Foucault, became members of the party. On the other hand there was Merleau-Ponty who influenced Foucault with phenomenology, especially Husserl`s. Besides studying philosophy, Foucault specialized in psychology but has never actually studied it since it was not possible to do it back then. His first job in Lille was thus teaching psychology and the early 1950s were for him all about psychology. However as early as 1954 a transformation occurs and his work turns to philosophy and anthropology which is due to his first reading of Nietzsche. He reads On the Use and Abuse of History for Life where Nietzsche criticizes 19th century historicism and emphasizes how important for the present time history is. This is fundamental for Foucault`s future work. It caused a huge change in Foucault. He even left France for Upssala where he stayed until 1959. Barzilay bases his argument on the notes Foucault used for his lectures titled The Problems of Anthropology which were prepared in the 1950s, right after the revelation that followed reading of Nietzsche. The 200 page notes dossier Foucault put together for the anthropology course is now carefully stored by his family in the archives. Barzilay got an exceptional privilege to be able to study them. In the notes Foucault works his way through philosophy until he comes to Nietzsche and his thoughts on the human of future, the human after the death of God and the relationship between the truth and history. The latter is of Foucault`s interest and he devotes most of his course notes to that. The link between the truth and history is crucial and ought to change our present perspective of Foucault. We need to step beyond the Anglophone reception of him and see different periods as a unity. Barzilay aims to position Nietzsche in Foucault`s works not only as Foucault`s way of seeing post-Kantian philosophy – as most scholars would state – but more. Foucault is for Barzilay only a Nietzschean, his work is merely a continuation of the latter`s, because Foucault talks of history with the idea of truth as always constructed. For Foucault truth is before power and he always seeks to get to it. In order to understand Foucault correctly we need to take his work as a whole. As Nietzsche, Foucault too suffered because he was misunderstood but as Foucault tried to “save” Nietzsche with explaining his thought, so Barzilay seeks to do with Foucault. It might make the former sound a bit pretentious but to some extent effective in his attempts to make Foucault be properly understood. There is only one way to do that, it is seeing him as a whole and as a successor of Nietzsche.